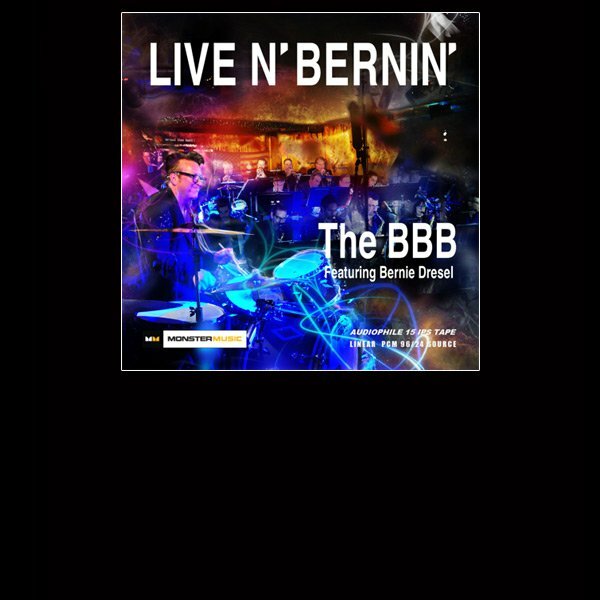 Bernie, a graduate of the Eastman School of Music, is the go-to big band drummer in the L.A. area, having played with the Brian Setzer Orchestra and Gordon Goodwin’s Big Phat Band before starting his own unit in 2014. Drawing on L.A.’s pool of great players he has assembled one smokin’ crew, and he drives the band with his high-energy style of drumming. Gary Reber was schooled in location recording as an assistant to the legendary Wally Heider, and went on to produce recordings for Shelly Manne and Buddy Rich, among others. He has been recording Bernie’s shows regularly for the last few years, just getting ready to capture the band at its peak for this recording. He recorded this album live in concert at Joe’s Great American Bar and Grill in Burbank, to 96/24 digital, and mixed it at Galaxy Studios in Belgium. We transfer the music direct from the 96/24 digital masters to tape. The result is a stunning audio and musical experience. This is the first time we have offered a tape sourced from a digital recording. We may do others after this one, but our regular Tape Project releases will continue to be made on an all-analog chain.